Mrs. Lucas thanks Martha Berry for the calendar she received. 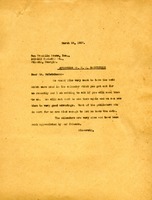 She also sends a check for $5 to the Berry Schools on behalf of the Fannie M. Newell Missionary Society. 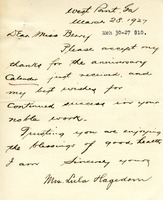 Mrs. Hagedorn writes to Martha in thanks for the calendar and with an amount of ten dollars. 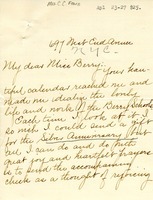 A letter from H. C. McCutcheon asking Martha Berry to send a check for the calendars that the Berry Schools recently received. 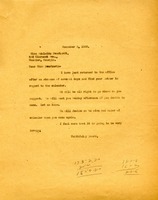 Martha writes to Mr. McCutcheon inquiring if he would send the cuts that were used in the calendar recently. 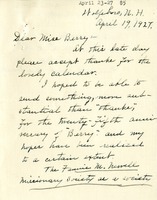 Martha Berry responds to Miss Everhart's request for the cuts of the calendar to be a quarter of an inch larger than previously asked. 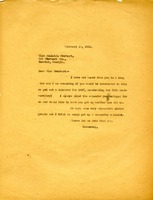 Martha Berry writes to Miss Adelaide Everhardt to assure her that if she decides to visit the Berry Schools on Sunday afternoon, they will decide the size and color of her calendar at that time. 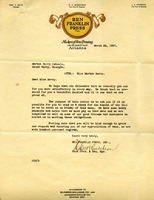 Author requests help from recipient to assemble 25th anniversary calendar after Everhart's help on previous calendar.